Once again, I need to begin this review by thanking Julie Daneilson for always featuring outstanding illustrators and generous images of their work on her blog, Seven Impossible Things and Betsy Bird who writes for School Library Journal at fuse#8 for writing intelligent reviews that call attention to worthwhile books and putting these works and their significance into context based on her vast knowledge and experience as the children's librarian for the Children's Center at the 42nd Street location of the New York Public Library. Their works always help me to write better, more thorough reviews here. And, I need to thank Enchanted Lion Books. 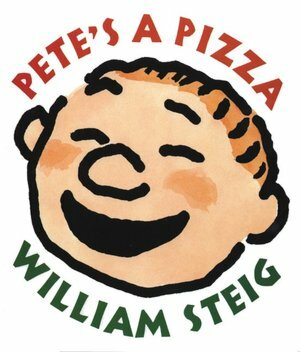 Despite being a small, family owned publishing house, they are constantly publishing stand-out picture books, from the magnificent Arthur Geisert and Bèatriz Rodriguez's books that are part of the Stories Without Words Series to the always enchanting and invaluable picture books from around the world that they seek out to share with us. Thank you, all of you! While turning a convention on its head is a pretty common theme in picture books these days, as Bird points out. Amy Krouse Rosenthal does this best with her Little Pea, Little Hoot, Little Oink trilogy in which a little pea doesn't want to eat his candy for dinner, a little owl doesn't want to stay up late and a little pig just wants to have a tidy room. And, while My Dad is Big and Strong, BUT . 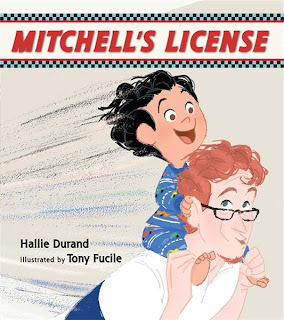 . . A Bedtime Story turns the tables with a little boy trying patiently and diligently to put his father to bed in a very charming, thoughtful (experienced...) way, what it does most for the world of picture books is present a Dad - that elusive, HUMAN Dad - for readers to enjoy. 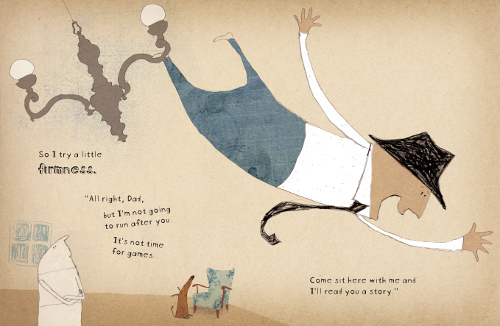 Dads don't appear too often in picture books, and when they do they are usually animals. Bears, mostly. And, while I love what Saudo does with her story, I just really like seeing a human dad in a picture book. Also, the illustrations for My Dad is Big and Strong, BUT . . . A Bedtime Story standout from everything else on the shelf right now. The pages in this big, beautiful book are thick and make a wonderful warbling noise when you turn them and the illustrations are a mixture of charcoal sketches and collage with a fantastic assortment of changing fonts and font sizes. I think this is expressly a characteristic of Kris DiGiacomo's, an American who has lived in France since she was twelve, European sensibility. The spareness of her artwork exemplifies the emotionally loaded atmosphere of bedtime. It can be sweet and peaceful, like stories before bed, or it can be frantic and pleading, often balancing precariously between the two worlds until sleep finally comes. 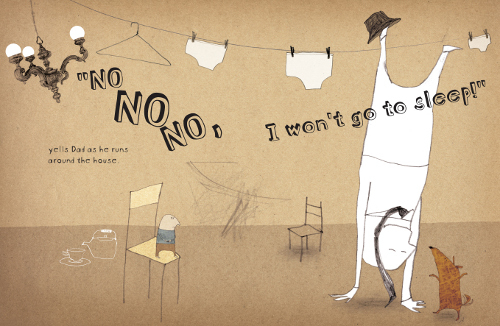 In style and tone, Oliver Jeffers, an Irishman, comes closest to DiGiacomo's style in this book. "My dad is big and strong, but every night it's the same old story. And this is how it begins: 'I don't want to go to bed!'" Clearly, Coralie Saudo has a child. The little narrator continues, "At first, I try to be nice. 'Dad,' I say, 'it's already quite late. You need to go to sleep now in order to be un good shape for tomorrow.'" It is very, very funny to hear these measured, well chosen words coming out of the mouth of a little boy, and even funnier to see him negotiating, comforting and cajoling this big, strong Dad. However, Dad does not respond well to his son's words. Getting firm doesn't seem to work eaither, but the offer of a story has Dad perched on his son's lap in a second, all smiles. As you might expect, Dad puts up a fuss when the story is over and it's really, finally time for bed. The little boy says, "when he looks at me with those pleading puppy dog eyes, I give in every time and read him another story." As a parent, my favorite passages come near the end of the book. Daddy is tucked in bed, but he looks like he's about to cry. That's when the little boy tells himself, "'Hang on, we're almost there.' Because a Dad who doesn't want to go to sleep is exhausting!" He goes on to tell how, even though he is so tired, if he heads to his own bed to go to sleep now, Daddy will "come after me and sweetly as: 'Son? Can I sleep in here with you?' And then putting him to bed again will be mission impossible! So, he needs to fall asleep in his own room." The picture of the Dad in the doorway, hat in hand, pleading look on his face, is incredible. How DiGiacomo achieves this level of emotion with a few quick lines is remarkable. 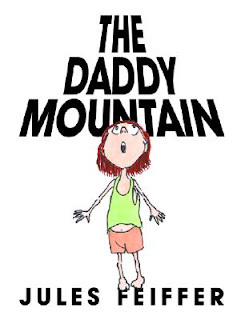 The book ends with the lines, "My dad is big and strong, but he's afraid of the dark. And so I leave on the lamp outside his room until he falls asleep." 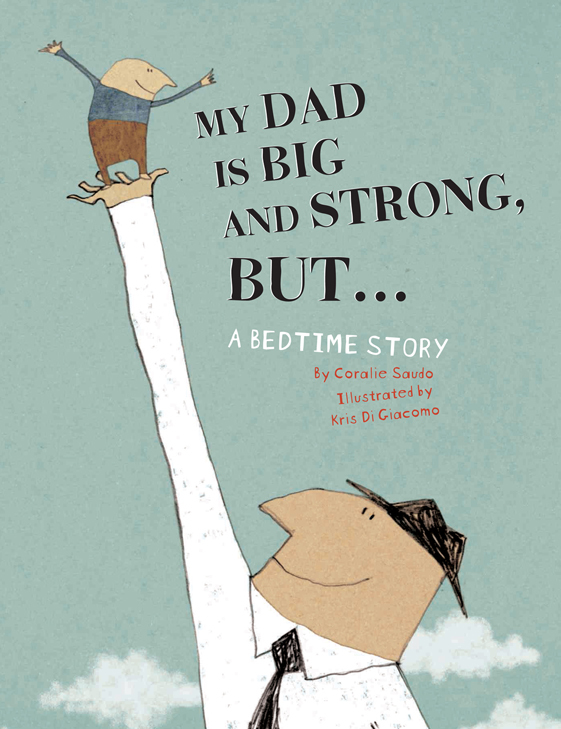 Coralie Saudo, who is an illustrator and author, does a wonderful job telling this story of bedtime travails in a way that is straightforward and honest, not jokey and playful, as is often the case in picture books that address the difficulties of parenting. It is clear from the start just how much the little boy loves his Dad and how important it is to him to do the bedtime ritual the right way. My Dad is Big and Strong, BUT . 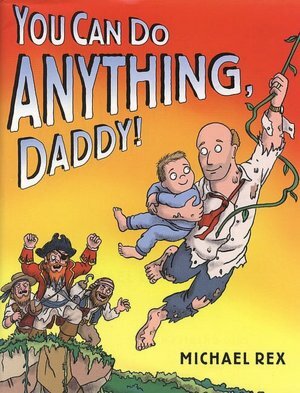 . . A Bedtime Story would most likely be pretty boring and didactic if told from the perspective of a dad trying to put his son to bed, but turning the tables and reversing the roles brings a level of originality to this nightly dilemma that will grab little listeners' attention and allow them to be invested in the story. Is translation an art or a science? A little of both, I think. In this case it was Claudia Zoe Bedrick who took it upon herself to translate the text of Mon Papa, Il est Grand, Il est Fort, MAIS. Now some translations feel wrong and awkward. Their words feel all elbows and angles, like someone tried to physically cram them into the wrong context. Nothing about this book feels like that. The language flows naturally like when the son explains to his father that he needs to get his rest so that he’ll be in good shape the next day “it’s right at that moment that things get complicated…” Bedrick is adept at pulling out just the right phrase at the right moment, but even more impressive is the fact that she manages to convey the right tone with the writing. 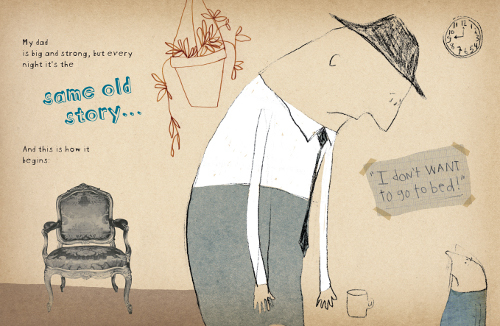 The book projects this very familiar parental feeling of affection riddled with irritation. It is sweet and it is patient but it is also pretty darn clear that the son would like to go to bed himself and that just ain’t happening. We relate. Kids won’t. They’ll just find it funny. Indeed! I look forward to more books from around the world, brought to us by the keen eyes of the staff at Enchanted Lion Books and the skillful translations of Claudia Zoe Bedrick!